You are here: Home > T-Mobile G2 OTA Rolling Out, Brings WiFi Calling? T-Mobile G2 OTA Rolling Out, Brings WiFi Calling? Well that was quick! Just six days after its official launch, there have been reports of a T-Mobile G2 OTA update rolling out this morning. The update is the G2’s first OTA update which reportedly enables WiFi-Calling (surprise, suprise) Mobile hotspot creation, update to the radio code (which will hopefully rectify the reception issues I’ve been having), and includes a few other fixes. We’ve yet to recieve the update on our T-Mobile G2, but if you’ve recieved the update drop us a line in the comments! I can’t wait. So many classrooms that I don’t get service in. Funny how now that there is an update available we suddenly see all these complaints about the G2 (bad reception, dropped calls, random reboots, etc) which have flooded the XDA general forum and even the comments below. I guess the honeymoon is over? Its not that I didn’t get service there when I switched to the G2, still didn’t have service in those rooms with any phone, mostly because they’re underground. That’s great news for those with a G2, good to see TMo delivering the goodies! That’s great to hear, wi-fi calling, better reception and tethering, fantastic. I wonder what the other trinkets are? Maybe to be able to turn off applications that’s not wanted(photobucket and others maybe)? It may be time to get this now once they drop the price a little for upgrades, or maybe add it to BOGO? that is exactly what I am waiting for!! I want it on BOGO need to upgrade 2 lines. I went to a t-mo store and they said to check in 2 weeks. They will add it, but not sure when. Doubt thats going to happen! The G2 would never be put on BOGO this soon after launch, hell it took the Vibrant two months before it got included in the BOGO deal!!! That is exactly what I am waiting for to get my G2…for them to add it to the BOGO deal since I need to upgrade 2 lines. T-mo rep at store said to check in 2 weeks. But then I really like the new mytouch HD also, but I can’t wait that long, I am so ready for new phone, I’ve had the G1 for 2 yrs now! I got my G2 this past weekend from Loyalty Dept. and got awesome deal on two phone…$99 for first (out of contract) phone and $149 for second (in contract) phone. Almost as good as a BOGO deal. Let me say…I love my phone. I waited for the perfect phone for my upgrade from my Blackberry and truly satisfied. It’s got an awesome design. If you are one of those ppl that hates “kiddie” looking phones…the G2 is a grown person’s phone. Only bummer for me is/was not having UMA as I am in a building with horrible reception BUT I guess now problem is solved!!! This phone is the truth! The BOGO as of yesterday is for the Vibrant only or the Vibrant and a Samsung messaging phone. nice day for a 75 mile ride to the t-mo store to pick one up. I sure hope they fix light sensor code, my KB backlight can never decide wether to stay on or not. That’s great news, but I still hesitating to make the move and get the G2……because of the loose hinge mechanism. trust me the only reason you should worry about the loose hinges is if your going to use your phone upside down and unless your a sloth.. I doubt you will, I’ve had mine since Sept 30th and am glad I made the purchase… just get it! seriously it is a total non-issue. i’ve been using the phone for a full week now and loving every minute of it. you will never notice the “loose hinge” unless you purposefully hold it with the tip of your pointer finger and thumb in such a perfect way AND upside down that it just hangs a little bit (which doesn’t even cause any kind of harm to the device). it’s the best phone i’ve ever owned. Thats what I am thinking about doing….just buy it. I played with it twice and it was AMAZING. I love the phone. May be its hard to believe, but may be I am the only 1 that don’t like the My Touch HD design. I have always felt that the “MY TOUCH” series is for girls and I don’t know y.
I called TMOBILE 2 days ago to get it. The agent told me she can give it to me for $149. I backed down, then 10 minutes later I tol myself “I will get it” so I called TMOBILE again and the agent I spoke with the 2nd time told me “$205” I then told her NOT THANKS and hung up. TMOBILE agents are so inconsistent. awesome, i was told last week an ota update would come but it was hard for me to believe. i will never use wifi calling since i have awesome service, but hopefully this makes led flash on the top of the phone come out (since it only flashes when theres low battery/charging..the trackpad does light up but you dont see it during the day time). does this also bring internet tethering? thats what phandroid says.. Yet I’ve been waiting over a year for an update on the original mytouch. I know its old, but can’t it get some love. Not everyone can buy a new phone every 6 months. Well that just makes me even happier that I jumped on the G2, it makes an excellent phone that much greater! I sure hope this is legit because altough I like my G2 I need this update. I have serious reception issues with this phone coming from a mytouchslide just like in the article. And I’m in one of there highspeed area. Also @Eye I notice the same thing as well with the keyboard lights. I had a similar issue with the mytouchslide and it only happens using certain apps. Like writing from my G2 to make this post on the browser and lights haven’t flickered once. Now if I open my tweetdeck app its like 4th of july on my keyboard. I hope some of the fixes also include being able to adjust the notification on the trackball. Am I the only one annoyed staring at my phone for what seems forever to see if the lights flashing? I adore my Vibrant more than I have ever liked any other phone BUT I pray that we get this update soon too. I don’t see why we shouldn’t and it kinda pisses me off we don’t get updates when other phones do but eh whatever. I don’t know much about how update rollouts work so I’ll just shut up and wish for the best lol. Honestly, if we Vibrant owners can get an update to 2.2 that enables Wifi calling and hotspot creation, and includes an integrated lag fix, I will wait until Christmas, just to know it’s coming and will work that way. 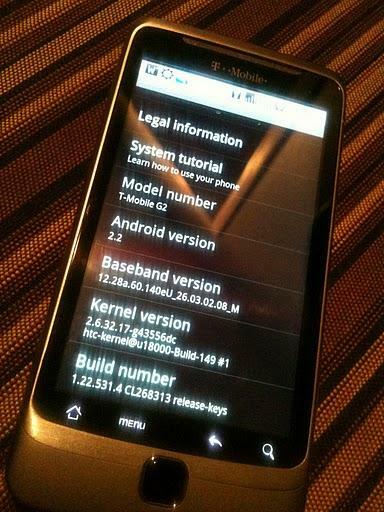 The only reason I would want to root this phone would be to implement the lag fix and to enable wifi tether. Let’s keep our fingers crossed! I really hope this update comes to the Nexus One users on T-Mobile as well. I really need this update since my service has been terrible in my house lately. Question will this have any effect on texting as well? The updates for the nexus one come directly from google right not tmobile? I’m assuming it wouldn’t get a tmobile update. OTA updates would have to come from, or at least through, the carrier, no? The update will come thru Google. The N1 isn’t a “tmo” phone. If you know what im trying to say. Just wait for the guys at XDA to get the install file so you can update thru recovery. You should have hotspot in the current N1 rom. Add Skype or use Gvoice if you want a wifi calling substitute. No Nexus One updates will come through Google. However, if you are a N1 owner (I have N1 + G2 ^_^) you are probably unlocked and rooted, so you won’t get any updates from Google. Just wait for the .apk to get ported/hacked to work on N1 (#teamdouche likely). Great now I’m going to be checking my phone all day! Thanks tmo news! I agree with gabeeee. Since vibrant owners just got an ota, I guess were out wifi calling or Froyo?????? If samsung cant fix the battery in status bar how can we expect them to give us anything else. Vibrant with froyo would be heaven but with samsung we will never see heaven. UPS drops off my G2 tomorrow, just in time for update goodness! Max – I’m not sure if T-Mobile is still doing it this way, but at the beginning of the month me and a few friends all went in and ordered the G2 on the same day. Me and 3 others chose UPS ground shipping and had our phones the next day. One of us decided to use Express shipping and his didn’t come until 5 days later. Where is this update for the Vibrant owners like myself? Don’t get me wrong, the Vibrant is the best phone I have ever owned, but the lack of Wi-fi calling has been my ONLY knock on Android. Coming from Blackberry, UMA was my saving grace. Hope we Vibrantites see this soon………and where the hell is Froyo???? I hope this is right! If I can show my sister and my neighbors wi-fi calling on my G2, Tmobile might be selling a few more phones/lines in the near future! Just what I have been waiting for to ditch a couple blackberry phones. That’s great news… looking forward to mine. I had originally heard the OTA was coming on the 16th. Either way it couldnt arrive soon enough. I desperately need the WiFi calling!! The radio update wouldnt hurt either!! T-Mobile is able to push OTA updates faster to Stock Android phones (G1, G2) because they don’t have to modify any of the overlays that MyTouch and Vibrant have. That’s the beauty of Stock Android. That’s why Nexus One owners got their updates first – Google didn’t have to mess around with making sure the overlays work. MotoBlur, HTC Sense, Samsunge TouchWiz…. They try and make the phone better, but all they do is slow down your updates – G2 – Stock Android update within 10 days of release, that’s how it’s done! myTouch 3G has stock, thank you very much? Hopefully those top notch chefs over at XDA like Cyanogen can take a look at how it gets its update so they can root it permanetly. I’d like to see Cyanogen 6 on this with launcher pro plus. This might be enough to get me to switch from the mts! Is it free to use wifi calling? Is there a seemless transition if you lose wifi signal? I think you still use minutes, so not really free. Just helps with reception problems. YAYY!!! I’m so excited! (I hope it also fixes the notification issues). I can’t decide if I should go buy the G2 now or wait till the update is being sent out. Also unsure if I want the G2 or the Mytouch emerald (more ram, better processor, ffc, more flavor than vanilla android). I would also like WP7 because of its media capabilities, but I need wifi calling. Ugh, guess I’ll wait it out. Always prefer phones with keyboards but I don’t think the G2 would give me any more excitement than my TouchPro2 except for wifi calling. According to the press conference yesterday, WP7 is “wonderfully delightful”. Did the country just change back to the 1950s when I wasn’t looking? Who is exactly is the target demographic which will see the words “wonderfully delightful” as anything other than something their mom would say? Sorry, the WP7 interface is fugly, too. I can’t believe that, after the hundreds of millions of dollars invested in developing WP7, MS farmed out the interface design work to Fisher-Price. Don’t care about WiFi calling what I care about is root. I’m not going to buy this phone if I can’t root it. Hopefully the OTA will help people develop a permanent root. According to all the experts. The phone will have root access. Its similar to the nand lock mechanism HTC has put in its last several phones. The memory has write protection. There is no super secret root kit or anything restoring the system. The reason the current root is temporary is that no changes to the system are actually being made because its read only. Linux acts like its writing but actually just putting info in cache which is lost on reboot. Gain write ability, gain root. It is only a matter of time before the walls fall down. I’m not willing to risk $500 on the belief that “It will happen”, I’m keeping my wallet holstered until it _does_ happen. FTR I think it will eventually happen too, but the question is when. no upgrade yet in Boston. Anyone else get it yet? I am awaiting somebody to actually get this update before purchasing a G2. If T-Mobile doesn’t have wifi-calling, I am moving out to another carrier when my contract is up in February to one that has decent coverage in my area (Minneapolis, MN). Coverage in the Twin Cities is spotty at best. Do ota updates, start automatically . Or do you have check for updates manually in settings on phone. If Mytouch HD isn’t coming soon, I may get it this week. Free tethering with smartphone/BB/android is a killing feature! It won’t replace landline internet (and we’re not supposed to do) but this gives convenience when needed. Wifi calling is another convenient feature which gives extra coverage where wifi is available. 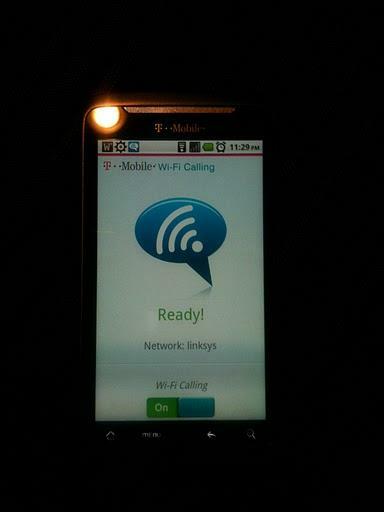 Wifi calling feature enables Text Messaging, Web browsing, MMS, and Calls to be transmitted over the Wifi network. The calls/text/mms part does use your Minutes/Text Bucket (unless unlimited). Just to get clarify that part. Sorry about the bad sentence structure, I have the phone. This OTA I don’t have it and don’t know where to get it. How do I work it? Your phone will notify you that you have an available update and would you like to install it. If you want to force a check (from the home screen) hit menu -> settings -> about phone -> system updates. Will the BB UMA feature carry over to Andriod so would be free calling still? Probably only if you have the unlimited hotspot calling feature. Breaking news david! Myouch to receive froyo 2.2 beginning tomorow as OTA , also in tmobile.com search for “mytouch” to see Myttouch HD running the new sense ! With Wifi calling, do you know if it uses GPS to know if you are in the USA? Or do they not care and let me use it internationally? The g2 is a really great phone. Im actually surprised with how fast the internet is. I stay in chicago and i always get a H on the top of my phone. I guess tmoble speedy Fast network is up and running here because 3g isn’t this fast. ok, has anyone here actually have gotten the update? I need evidence that this exist! someone who commented over at the engadget.com post of this article got the update and says everything is true. Can you share any details? ….I’m new to phone technologies, but being able to creat an hotspot, is that the same as tethering?? Yes. It is wireless tethering. Multiple devices can be tethered to a wireless hotspot. This is how it should be. Very excited to hear about this. I just called Loyalty and ordered a G2. yes only instead of USB you use the WIFI on the phone to broadcast the phones internet so it can be used by anyone with the key that you setup. Think of it as being just like your WIFI router at home. “Tethering” strictly speaking means connection by wire (USB in this case) which also appears to be enabled according to more pics in the original thread (only 2 of which are posted here) but you can also “tether” by Wi-Fi Hotspot (for up to 5 computers I think) which is much more convienient, as you need to install a modem driver on your computer (often done automatically when first connected) in order to tether via USB, after which a dial-up node is opened by means of Windows network manager, or a carrier-supplied communications manager. You can also tether in some case by BlueTooth if the BT stack includes DUN and/or PAN profiles, which Windows Mobile 6.5 least does (not sure about WP7) but I’m not sure about Android at this point, it may not have these profiles yet. In any case, along with Wi-FI calling these features make this phone really sweet now. If a few other bugs are fixed as well, that would be great. By the time my upgrade rolls around next year this phone and the MT HD should be rockin big-time. I’m not all that enamored about WP7 right now, heck I’d rather get the HD2 and stick with 6.5 and use my apps or just switch to Froyo on the new Androids. THIS is what i wanted to hear.. u get BOTH USB & WiFi (Hot-Spot/AP) Tethering. Will having the wifi calling feature running all the time use up the battery because it would be constantly using wifi? That really depends. If you’re using UMA in a low-signal area, you can definitely save battery because the phone is not having to work hard maintaining a signal or bouncing off of more than one tower. UMA provides a solid, strong and reliable signal in that scenario. However, if you’re in an area where your signal is fine, you’re going to drain the battery if you turn WiFi on because you’re using two radios instead of one. Activating UMA when you have anything more than one or two bars *is* going to drain your battery faster and it’s not really going to get you anything more in terms of making or receiving calls (except perhaps slightly better voice quality). In using my Nokia E73 with UMA, I needed to have it in my basement and it worked fine, but I would always forget to turn it off when I left the house and my battery would drain much faster. Just my two cents. @Matlock the G2 is being included in the BOGO deal. I’ had upgraded to 2 vibrants. The day G2 was available I’ returned to the store and asked if I could return one of my vibrants. I’ traded it for the G@ :) !!! That sales rep that allowed that transaction for the G2 in a BOGO is probaly getting ripped a new one or fired. G2s are not part of BOGOs within Tmobile corporate stores. @Matlock the G2 is being included in the BOGO deal. I’ had upgraded to 2 vibrants. The day G2 was available I’ returned to the store and asked if I could return one of my vibrants. I’ traded it for the G2 :) !!! Has anyone experienced this OTA update on the G2 yet? That exact same thing happened to me. I went to grab my phone about 12am yesterday to use the Directv app to schedule something and saw it had rebooted and was stuck in a boot loop on the G2 screen, it’d be on then off like it was booting then on and off again. I just pulled the battery because I didn’t know what was happening, and I guess I interrupted the update. Oops. I have been seeing this happen frequently with my customers. My guess is that this happened to you when you were in a low signal area. That seems to be the most common cause. Oh, and pull the battery, its not going to recover. Suburb of Boston, have not received mine yet. I am patiently waiting for it as I pound my fist thru the damn table. nah, in Pittsburgh, haven’t got mine yet either I really don’t think updates are location specific though,…. are they? Nothing in Sunny Central Florida either.. The post says, “mobile hotspot creation”….does that mean teathering? If so, let me be the first to say, Hell Yea! hell yea that’s what it means! I went to grab my phone to use the Directv app to schedule something and saw it had rebooted and was booting back up. Well, it was stuck in a boot loop on the G2 screen, it’d be on then off like it was booting, then on and off again. I just pulled the battery because I didn’t know what was happening, nor did I know about an update or see anything download prior to the boot, and I guess I interrupted the update. Oops. But as we speak it started again…. Can anyone post or comment on how the wifi calling is working, if you turn off the mobile network and run strictly on wifi are you able to make/receive calls and texts and data flawlessly? do texts work over wifi too? Not sure about Android platform, but on BB all functionality worked, internet, phone, and messages. No Issues at all…. Yes, if you receive the OTA with the WiFi calling feature, texts will also work. However, I find all of this very dubious as T-Mo has been extremely quiet about what amounts to an amazing update. If they are doing it, my guess is that it will be to a small customer base. PhoneDog posted pics of an updated phone with choices of “USB Tethering” and “Portable WiFi Hotspot”. I don’t mean to sound like a duh-duh-dunt but does this mean I can get on my laptop and use my phone as my hotspot? If so, that’s a spicy meat-a-ball (using my best “The Mask” voice…lol)!!! USB Tethering is great, but WiFi hotspot…even better. Oh please be true, lol. Did you see the source link for that site?? One of a few, but I felt like linking to the article that thorax1 mentioned that contained the pic that was posted by one of those XDA peeps. So foxeh, your basically saying with this new OTA update we’ll not only get wifi calling but we’ll also get that sweet wifi tethering nectar too? Wifi tethering such as my G2 tethering to my iPad, right? RIGHT? I’m saying that’s what every major blog has been saying, G1er. ;) This would be perfect for an iPad user such as yourself. Yes, you can browse the web with your laptop by using your G2 as a wifi hotspot. I use my Nexus One to do this on occasion and works great. OK So I called TMO regarding my phone rebooting and and they basically told me that I may have a defective phone, and that they are sending a new one ASAP to me. It seems that in order for you get the OTA, you will receive a notification (similar to a message one i guess) on the notification drawer. Once you get that, then you can go ahead and do the download. I explained to the tech, that my phone went nuts notifying me of things that simply weren’t there before it started to reboot by itself. I hope that this is simply an individual device issue, not a what is going to be with this phone going forward…. You obviously need to bring yours in first through UPS right? In order for them to ship you a new one? Also, you gotta be in the buyers remorse period of time to get a brand NEW phone… Or else after the buyers remorse period is up you get the refurbished ones… Eww.. When a phone is released the manufacturer sends a bunch of phones set for replacement purposes… No accessories is more cost efficient.when the phone gets old like the G1 you start getting refurbs. hold power, volume down, press track pad. I thought I was safe from the rebooting bug but my phone just rebooted wtf??????? Is anybody elses doing that randomly? Yes. Here and there… Maybe once every other day.. I GOT IT!!!! it was a quick update, loving the wifi calling!! awesome! going to try wifi modem now! Those numbers spell “checkin” on the dial pad. I tried it, got “checkin succeeded,” but it seems I’m not eligible for the update quite yet, I’m afraid. just dial that number or do i put my area code in? Tried it as well – same result – no OTA yet.. oh well – hopefully I will get it soon! all it gave me was checking successful, should i start downloading right away, or did it take awhile for the ota to start downloading? You got it huh? You got the update that TMobile said isn’t out. That’s one hell of a phone you have! can someone confirm the mobile hotspot? im getting my phone from ups tomorrow and i want to knoowww! what are the settings like? I just talked to a Tmobile store manager here in Irvine, California and he said that the update will be out officially in a month or so but the hotspotting and tethering will be available for a fee like other carriers. He said that wired tethering can be worked around by PDAnet. And you believe this store manager??? i know this is a little off topic but i have a question for the g2 owners im thinking about upgrading to the g2 but i wanna know can you upload pics to craigslist straight from the browser? this is a dealbreaker for me if it cannot . The OTA is bogus and I don’t believe anyone has really got it.